Can you find your scissors? Can I find all of my supplies? I try to remember to put everything back in the same place when I'm finished using it. You would think this system would work. But I get in a hurry and think that I will just leave it out and then put it away next time. I then proceed to walk away and begin something else. The next time I need the supplies....can I remember where I left them? No, I can't. I run upstairs...look in the living room, thinking maybe I was watching TV while working. But no...wrong room. I check the bedrooms, run back upstairs to look again, look in the studio and finally the last place in the world I look....the dining room, there it is. I bet I waste more time looking for things than I spend working. Scissors are the hardest things for me to keep in place. I told my husband, "People are coming into our house at night and stealing my scissors." I don't think he believed me. Between me and the kids there was no hope to ever find a pair. Only now, after my kids have left the nest am I beginning to find some of them. They might be dull....but at least I can hack things apart. But never fear....no need to be like me. I have 4 scissor bags to give away. Moda fabrics made these cute canvas bags. You can tell what they are for just by looking at the picture. I got one for me, one for Barb and some for you too. 4 lucky winners will be drawn. You know the drill! Leave a note in the comment section and the bag could be yours. You don't have to leave a long comment either....just the word "scissors" will do. But if you have words of wisdom for me that's great too. I can use all the wisdom I can get. Deadline July 9th. Good luck! Hope you can find some scissors to put into this bag! It's a stitching day for me. One of those where you sit in a chair all day and wish you had something great to eat....Unfortunately the things that sound good are all high calorie. Don't you wish you craved carrot sticks and celery? Oh my gosh! How cute!! I had that same problem once... my scissors went missing. I never did find them, even when we moved. I had to go and buy a brand new pair (aw shucks). I do believe there are scissor fairies or elves who take them at night. A good pair of scissors is a coveted item! Oh, love the bag! Please include me in your giveaway! I only have a limited supply of scissors so I always know where I leave them. Needles though...that's another thing. I lose those all the time. Don't I wish I could crave carrots & celery??? Are you nuts! Chocolate is soooooo much better. A couple of houses back (we've made 10 corporate moves) I had a sewing room with a lock on the door just so the kids couldn't take off with scissors and other goodies. Now I can always find my scissors........yeah! Alma, I don't even want to tell you how many pair of scissors I have and I can't begin to tell you where they all are either! A bag would be so "handy" to place them in, then I would only need to keep up with the bag! Yes, someone does come in the house to steal scissors. And only the expensive ones. The ones with a broken tip and cracked handle always seem to be there waiting for me....sigh. So I broke the bank and bought a set of really cool Dovo scissors that are in a zippered case and I keep them in a project bag that goes with me everywhere. So far so good. Oh and I also threatened and I really mean PROMISED to harm someone if the scissors were disturbed! Love the Moda bag...of course I need one! Great bag - I addressed the scissor fairies by buying multiple pairs of scissors every time I had a 50% off coupon for Joann's... right now, I can see 5 pairs - no fairies lately! I love the scissor bag. I haven't lost any scissors, maybe it's because I have so many, but not enough! LOL! What will they think of next. How cute is that bag. Pleae sign me up of the drawing. I tell my husband all the time that scissors need a built in monitor like the telephone, when you lose them, just push the find me button and they will beep. I'm thinking of applying for a patent for my idea, what do you think? I like that little bag. Very cute. I told my son when he was a little boy to never use my scissors. He has done well. I must have scared him with "the look"
What a cute bag for scissors! I sometime feel like I need to implant a good magnet somewhere in my body to collect my scissors instantly!! I have my son trained to ask for the "fabric" scissors or my regular scissors. He knows that the fabric scissors have to be placed back into the sleeve for protection. My husband, on the other hand, takes any of my scissors to cut his nails, etc. He knows to hide from me because I usually end up screaming and telling him how expensive they were. Some people just don't get it. LOL. Oh, the bag is so cute! Please include me in your "scissors" giveaway! I love scissors!! I think I have more scissors than thimbles!! My mother loved scissors and passed that passion on to me and my sisters!! Have a wonderful stitch day. I'm having one too! This is so funny. I can't tell you how many pairs I have bought because I couldn't find the NEW PAIR I just had! Surely, a person my age (49) would put them in the same place...KNOWING...that it seems to be a problem over the years! Big smile...I guess we get going so fast that we forget where we set them down. I even use a sharpie marker and write "SEWING ROOM"...SO no one would dare take them out of the room! But I lose them in the sewing room! Cute bag!!! Wonder WHICH scissors I'd keep in it??? Hmmmmmm . . . .
That is one great looking scissor bag - please enter me in your drawing. Sometimes if I misplace a pair they stay gone for days - almost as if someone is playing a trick on me...then they just appear again as if from the air - a bag would sure help!! We should start a Club! I have many pair of scissors and sometimes can't find even one. I don't have a solution to the problem! I sure would like to win one of the sissor bags .... maybe I could find my sissors. would be great for my travel bag! Here is hoping for one of the cases Alma. Regardless, I love reading your blog and check it regularly. Loved your 4th display. went to Prairie Point this afternoon and ordered a copy of the book......for next year's display!!!!! My favorite scissors for rug hooking always go missing! Probably with my readers! What a CUTE bag! I would love to win one. Maybe if I left it open in my sewing room overnight, my wayward scissors would fine their way to it and I would know where they all are. :-) Very, very cute! Oh Hallelujah! A real "place" for my scissors! How wonderful your giveaway is. Please enter me. I thought I was the only one that had thieves sneaking in at night & running off with my supplies. thanks. I have a scissor fetish...have them in all sizes and shapes. I still manage to misplace them! Has the little bag helped? It would be fun to win and see! Unlike you Alma, I don't seem to have a problem with scissors - my missing essential is my rotary cutter. I had so much trouble locating the first cutter I bought, I eventually bought another one only to find the first cutter within an hour of bringing the new one home. Of course, since then BOTH have disappeared. I remember when I last used a cutter, telling my sons to remember where I was putting it when finished. LOL Their memory is as bad as mine! It's not essential to them, so they didn't take notice. Now I can't find either one. I need to purchase another pair of dressmaking scissors though, broke the handle of my last pair. I do have 3 embroidery scissors, which rotate through projects - they all have fobs on them and I look for the fobs before the scissors. Scissors are like shoes.....you can never have too many! I'm still looking for a pair of mine! Please enter me also. Oh, do I know the feeling looking for scissors and finding none. What a delightful bag. Cute bag! Are they available to be purchased? A scissor bag...brilliant! You have to love something so practical and cute to boot. I never can find my scissors either! Maybe a cool scissor bag would do the trick! Love, love your stuff! I have a pair of scissors that would fit in that bag so please include me in your giveaway. I really look forward to reading your blog! I'd love to win that really, really cute scissors bag. It's darling! What a cute bag! I have problems losing my scissors and needles. Do I have scissor fobs and needlebooks and pincushions to help me keep all those things in sight? Yes, do I happen to use them? No! Go Figure. Thanks for the giveaway. Hope I win. I would love to be entered into your contest. I only have one pair of scissors so a bag would help alot. I have not seen these little bags before and would love to enter the drawing for a chance to win one. My solution is that you can never have too many scissors. There are some in a basket on the table, a pair on the arm of the sofa, several pair in the travel stitching bag.......well you get the drift. Oh, and there is always a new pair that I am sure to be drooling over! I know they will be mine soon! Between scissors, needles, and house phone, we lose these alot at our house. Please enter me for a chance at the scissor bag!!! Oh, I love the scissor bag. I do have a flower frog that I use for smaller scissors, but I'm forever putting my larger scissors who knows where! They end up all over the house. I can't tell you how many pairs of scissors I've had to buy because they just didn't have a decent home. Then later they show up under fabric, under a chair, in a drawer. I chastise my husband for leaving his hammers and measuring tapes all over the house and then I do the same with my scissors! Oh, then there is the kid factor too - they use the sewing scissors for cutting paper. They really need a good home - that cute bag would do it! Great giveaway! Such cute material. Scissors? I love scissors and have collected way too many. There are just so many irresistible sizes and shapes and colors. I would love a bag for the current favorite pair. I think the only answer is to have lots of them. I pick up cheap very sharp embroidery scissors whenever I see them and have them in all my sewing spots that way I can always find them (multiples). I think I have a pair of scissors on every flat surface of my house! Would love to win the bag. Thanks. Kathie L.
Oooh yes please. I'd love to be entered. This bag is AWESOME! And a must have for a scissor nut like myself!!! I wish carrots and celery tasted like a Big Mac and french fries. I would eat carrots and celery every day if that were the case. Sorry about the scissors. I think there is a scissor fairy just like there is a sock fairy. Thanks for the giveaway. Have a great day. Cute bag! I solved the lost scissors problem by buying more scissors. Not a good solution. Someone steals them too. Leave the scissors with the chocolate and if that doesn't work, just buy another pair! I would love to be in the giveaway please!!! My scissors are always hidden so no one cuts thru paper. I never lose my scissors. I have for them a fine wooden box. But I have two daughters. For any reason my scissors are necessary to them. To cut out a picture, to cut a bang and even to make manicure! My girls never put scissors back. I find them in different places. Once it was CD-ROM of my computer... I hope, this fine scissor bag will be the best "house" for my scissors! Thank you, Alma and happy stitching! I love the scissor bag! I am always losing my scissors...especially down the side of the couch, on the floor. I never know where they are going to turn up. Maybe a bag would help me keep track of them. Thanks for the giveaway. What a cute bag, I'd love to win! What an awesome bag. I would love to win one. I would live a scissor bag. Please include me. Scissors -- my solution is to have multiple pairs in different places. Although they seem to migrate and I can either find several or none. Another lifesaver is having inherited a couple dozen kid's Fiskars from times that a friend and I led children's art projects at our museum's Family Days. They will take care of a lot of things, and the great thing is that you can throw one into each project bag you've got going. But this scissors bag would be a wonderful addition -- a place to keep those special scissors -- the stork scissors that were a gift, etc. -- and the one-of-a-kinds. 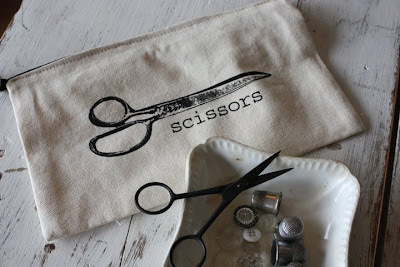 Love this idea and would love to be included in the drawing for the scissor bag. Sometimes we really do crave celery and carrot sticks! I LOVE scissors! I'd love that cute bag for my scissors. I have over 25 pairs of scissors (paper, material, ribbon, safety, sewing,etc) so I could really use a very cute scissors bag. Love the scissor bag. Please include me in your giveaway and I'll keep my fingers crossed for winning. Geez...glad I'm not the only one spending more time looking for my sewing supplies than actually working. I have a 'chair' that 'eats' my needles! No doubt I still wouldn't know where my scissors are, but what a great bag! Love the bag! Scissors! Scissors! You all find the neatest little things! Hi Alma, I try to have a pair of scissors with each project, but alas the scissor stealing fairies take mine too. My only solution to this problem was to buy more scissors. I have them everywhere, each room has a pair that belongs in that room, know by color, shape, size, or even labeled. Then each stitching bag usual has it's on pair, a pair for the tool bag I grab for away stitching, you get it. The more the merrier. Although I do have a couple of favorites that get special care. For starters, I try to put some kind of scissor fob on each pair. When I work on a project, I have one of those rattan plates that are used to hold a paper plate at a picnic. Anyhow, that rattan plate holds any of my "stuff" like thread/scissors/pincushion and I ALWAYS put my "stuff" back on the plate as I use it. Sometimes I use a basket instead. It helps to keep everything in one spot and is easy to transport. I sit the plate right on my project usually! Thanks for the chance to enter your contest! Your scissor bags are really cute! Great bag. Please enter me in your contest for the bag. I have the same problem with not putting things away and then can't find them! The scissor bags are very cute! Please enter my name in your drawing. Thank you. I LOVE that scissors bag! I lose mine constantly and it would be a great thing to take to quilt retreats. LOVE, LOVE, LOVE. What a neat idea for solving a problem. I'd love to be intered into the drawing! Ooooh, that little bag is adorable. I have so many pairs of scissors; each with a specific job. LOL!! Will I be a lucky duck today? Love your blog! I have just the scissors to go in that bag! Please include me in your great giveaway. Too cute!!! Please enter me! Love the bags....the only way I will still probably be able to find them is if I fill the bag with ground walnuts and attach the scissors with a ribbon....Thanks for thinking of us! You are most generous of spirit! Love the scissor bag, please enter me in your giveaway. I am one of those that thinks I will always know where I left them last, you know in the supply bag with the last project stitched...right!!! Ha Ha, I hear you chuckling. Problem is...where did I leave the bag? I could really use the scissor bag. I seem to collect sewing scissors of any type which helps when I misplace a pair I can just use another. Thank you so much for the draw. Please count me in! I lvoe the Scissor pouch and since I've lost the sheath to my 8 1/2 inch Ginghres, I know excatly waht will go in it. Thanks for the opportunity! I ove the bees - I don't know if we have them in Georgia. Guess I will google!!! Love the scissor bags!! Thanks for all your fun giveaways. Your blog has become my favorite! You always find something I can relate to either as a stitcher, an eater, a forgetful person, or just part of the mess of humanity. Related to looking for things, my Grandmother always beleived in the hereafter...she would go in a room looking for something and forget what it was she was looking for... always wondering what am I here after. Losing scissors is a favorite topic of my stitch group. One lady was always losing hers. She sat on a couch that had spaces between the cushions. We always had to tell her to check the "crack". Now that is our only answer when someone loses their scissors. Very nice of you to give away bags to keep our scissors in. Wonderful idea! And I am with you. I crocheted a string and hung my scissors around my neck.... but now I lost that too! lol. Such a sensible and easy idea to keep things tidy. Never ceases to amaze me how people can see these good ideas which a really right in front of our noses all the time. I love the scissor bag, Alma and I will find a pair of scissors to keep them nice and safe in the bag. Oh what a cute bag. I could definitely use one of those. My kids have all left the nest, but scissors still have a habit of walking away! The bag is so cute. Id' love to win!! Maybe if I win the scissor bag, I may finally get to have more than one pair of scissors! I have scissors tucked away all over my house. I have them in every room in small wooden boxes, tied to candlesticks, but I still have to hunt for a pair when I sit down to stitch. I think I have a scissor gremlin in my house. Oh yes! I could make good use of that scissors bag. I am constantly losing mine too. You think this bag will really help or will we misplace that as well??? I lose alot of things but for some reason I always know where my scissors are but I still would love to have that cute little bag anyway. Don't leave your scissors on the sofa...they hurt when you sit on them, usually after they have wiggled to be point up! Funny thing that all sewers can relate to your predicament! This is why I have to have sooo many pairs of scissors! I love the scissor bag. Can't wait to be in the drawing! My scissors are just itching to have such a lovely home! What a cool bag, Alma! I'd love to win one for my scissors! What a cute little bag. Not sure it would help me locating my scissors, but I'm willing to try. Well my problem is, even after I pick up after myself and put things in order and in a "safe place," I still can't find them. Maybe a scissor bag will help the problem? Yes, include me in the drawing for the scissors bag. I have several pair of scissors so I can lay them all over the house!! Usually the moment I say out loud "I can't find my scissors" they magically appear. The bag is really cute. Thanks for the opportunity to win. Loosing my scissors is a daily occurrence. I finally crocheted a string on the end making it easier to find them when I reach in the bag. I used to just have a string around them and wear them around my neck. The bag is adorable. Maybe it could help. I love bags, too, and this one is very cute ! I have sissors everywhere! Of course I could use a scissor bag! I would love a scissor bag, I love scissors....I can't help but buy embroidery scissors. They make them so darn cute, gingher is especially guilty of this and dovo who could resist on little pair of them for sure. Maybe thats my answer, just buy more Alma....one for each project!! Its quilt show week here in Central Oregon I bet the quilt shops have new cute ones. I could really use that bag! I love the bag !! I always put my scissors in a "safe" place but I don't always remember where it is. Please enter my name in your scissors drawing. Thanks! Love your blog... I'm so glad you decided to start a blog..
That little bag would make my scissors soooooo happy...and me too! Scissors! What a great bag and even greater blog. I'm really enjoying it and want to thank you for starting it. would love to provide a home for one of those "too cute" scissor bags! I'm usually pretty good with where my scissors are, but it's those darn pesky quilting pins that seem to find their way off of my sewing table. A girl can never have too many bags for our stitching goodies. Love you to put me in the draw. I misplace my scissors while using them...they get buried in whatever I'm working on at the time! Love the scissor bag! Please enter me in your contest! Have fun stitching! I always love working on your patterns! They are quite inspiring. Thanks for sharing your extra scissor bags. I hope you can find them when it's time to mail them out!! Yes please - I would love to be in on this draw. And will we be able to purchase these bags or fabric? 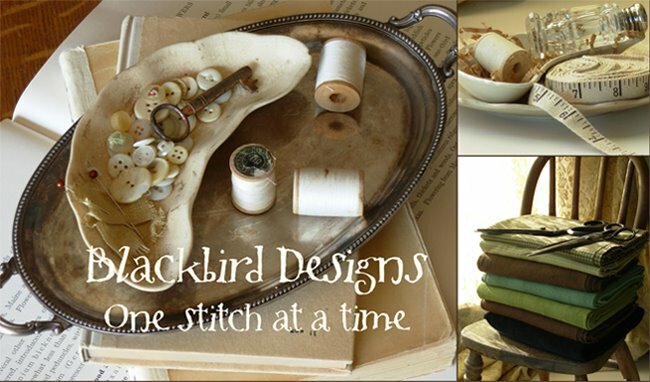 Do love your blog and ALL your designs!!! I love the scissor bag! I have five kids and buy them scissors every year for school. Wouldn't you think that would mean there'd be dozens of scissors floating around my house? I'm lucky if I can find one! I love that idea. I have so many scissors it's not hard to find a pair but I think they would be great in one pouch. I always accuse that my scissors are stolen ! please add me to this giveaway. Oh my that is not a good thing to be losing your scissors..heaven forbid you might sit on them!!! I have scissors everywhere in my home and in my workroom..I even have the name Scissortails as a business name and part of my email addy....love the word...love how it looks in print...How about having a chatelaine or laniard to keep them around your neck..? Very handy bag, and so chic! I usually find that I am sitting on mine-all I can say is ouch sometimes! Cool bags! Scissors!!! Love them, hate losing them. Uncomfortable finding them in unlikely places, because I SHOULD have remembered where I put them! It's just amazing how many things cease to disappear when children fly the nest. Scissors, safety pins, food, money (I seem to have more now anyway) and ice cream, it seems to stay in the freezer waiting for me now, yum. I love to read yoour everyday stories! Quelle ravissante pochette à ciseaux !!! This bag is so cute! What a good idea! It looks better than the plastic bag they sell with scissors. Love to be in the draw. Thanks for this giveaway and for the beautiful free quilt pattern! Have a nice stitching day! Hugs from France! that's too funny Alma, I could just imagine you running through the house hunting down some scissors. I always blame Miss Murphy (my cat) when something is missing. Greatest part: she doesn't object to be named the culprit. As long as she gets her cat food, she's one happy furball. As for the bag, I'd love to get one. A good pair of scissors is a quilters best friend. I often misplace not only scissors but also many things. I really need this cute scissors bag! Scissors! Oh please, please, please... love the bag! Thanks for the opportunity! love the scissors bag! Sue B. When our mind is having problems our eyes can take over ~smile~. I would love to be included in this draw. Words of wisdom - now let me think!! I've been giving missing scissors quite a bit of thought recently and the only thing i can come up with is attaching my scissors to my mobile (cell) phone like a phone fob then, everytime my scissors are missing I can ring my phone like I do when that's missing and...lo and behold, both phone and scissors will give themselves away - talking of giveaways, I'd love to be entered for this pretty bag giveaway then I can keep both my phone and my scissors safe..haha! Thanks again for your generous and unusual contests. The bag is cool, but then any bag is cool to me. I have scissors in each room: my living room where I sit and applique and the sewing room. I finally got a holder for my bigger ones and keep a pair at my sewing machine. Love your fabrics and books. For every needlework i use a basket. In it scissors and a couple of needles. And the work and pattern of course. Wouldn't it be simplest if you had two pairs for every room? (Shears and embroidery) With the lovely scissors available you could certainly match every room in the house! What a cute scissors bag! Hopefully it will be much easier to find than just the scissors! I only have one pair of scissors I use for stitching so the scissor-stealing gnomes best stay clear of my house. Thank you for including me in your drawing...I enjoy reading your blog very much. Good morning, and what a wonderful day it's going to be after seeing your scissors bags. I have many pairs of scissors, too many to count actually, and whenever I get another pair, I get looks like 'don't you have enough already' - but does anyone need a reason to buy more items for stitching? I really like the scissors bag...my scissors seem to have a need to take a vacation from me also. Please enter me in your drawing. thank you! Wow, this has been a popular post! Scissors are also something that run away from me and hide. Needles used to be a problem but now I have about a zillion pincushions, so at least the needles can find their way to a pincushion (of course, then it's up to me to find said pincushion, but no system is perfect!). I'd love to be included in the drawing, and thanks for offering these fun opportunities! I think if I ever found all my scissors I'd faint at the number that I had....they end up in project bags, on tables, in tote bags,etc....love the scissor bag! maybe it would help me round them up! Love the scissors bag! Please, enter me into your drawing. Love your blog! Thanks for chance to win scissor bag! I use my thimble case as a scissor fob... only problem is I can't find two things now instead of just one! I think Rachel's scissor elves are here in Wales in the UK too. How lovely bag and giveaway! Yesterdah my LF walnut base arrived and I ordered some scissors too, would be lovely to put them in the bag. So please include me in the giveaway. I finally broke down and bought duplicate scissors for several of my usual sewing spots. But do you think that made any difference in the missing scissors situation? Not much! I would love to be included in your drawing. What a fabulous little bag! That bag is adorable! I love it! It looks like it's from the new French General line. I love their stuff! Leave it to Moda to solve all of our scissor problems...what a great bag! Whoa! Fun giveaway! Thanks for the opportunity! I have the same issue, I have so many pairs and yet I can never find just one!! No words of wisdom, Alma. I need a bag like that myself. Kindly add my name to your giveaway. Thanks!